What a great month to go fishing in Fort Lauderdale. The ocean is alive with fish! This month, we’re catching sailfish, tuna, wahoo, amberjacks, sharks, barracuda and more. Pretty much everything is biting off the Fort Lauderdale coastline this time of year. 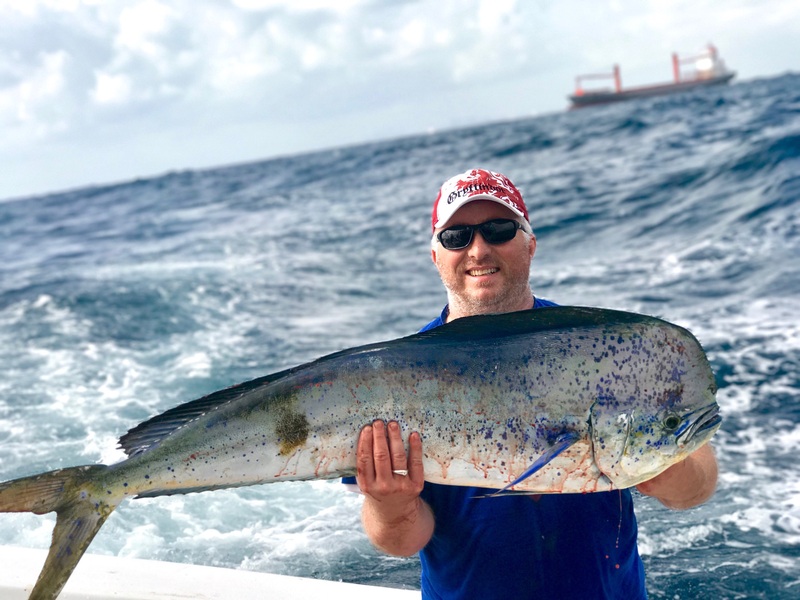 We have our lulls in fishing throughout the year, but this month makes Fort Lauderdale look like the most epic fishing destination in the world. With our fishing grounds just a mile offshore, its super convenient to get out to these productive fishing grounds. Nice dolphin caught on our drift fishing trip aboard the Catch My Drift. Dolphin are the billboard fish this week. They’re biting in 100-200ft of water, just outside the reefs. They come in close to shore this time of year, getting pushed in with the stronger East winds. Flying fish, one of the main fish that dolphin chase and eat, get pushed in closer and closer to shore with the East winds. When flying fish jump out of the water and spread their fins, they get blown the direction the wind is pushing. If the wind has been blowing out of the East for a few days in a row, the reef gets filled up with flying fish. This in turn brings the dolphin in with them. It’s all about the food. These conditions make April and May the best couple months to fish for big dolphin off the coast of Fort Lauderdale. 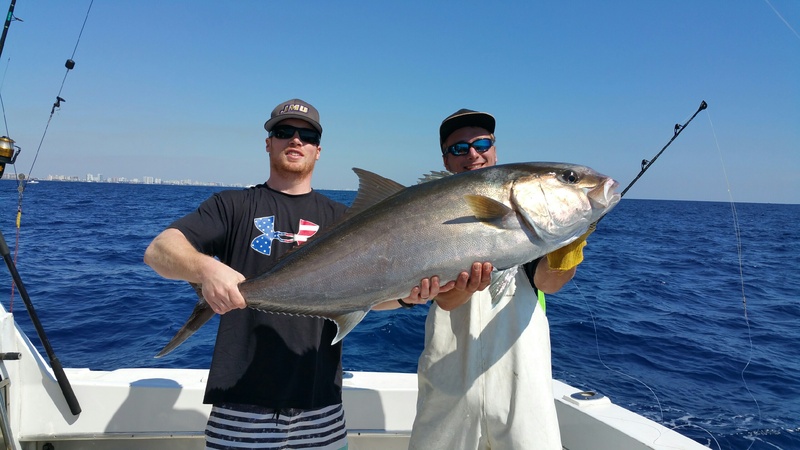 Nice blackfin tuna caught by this guy on our sportfishing charter. Trolling the reef is red hot action as well. Blackfin tunas, bonitos, kingfish and barracuda are all biting on the reef this week. We’re catching them pulling strip baits and rigged ballyhoo on surface trolled baits and on our deep running planer baits. 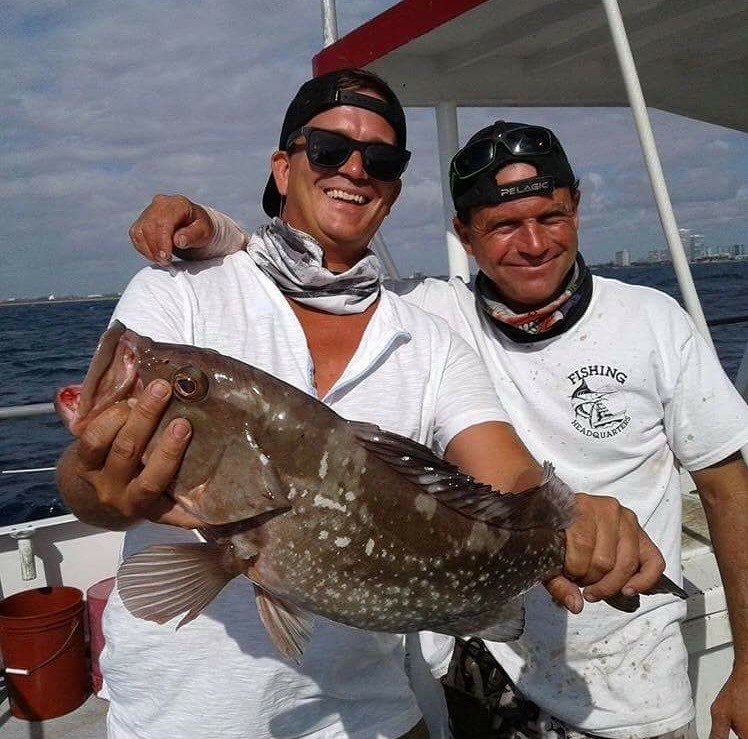 It’s a great spread of baits that can catch just about anything fishing the Ft Lauderdale reef. On a rare occasion, we’ll even catch a great big ole’ wahoo or even a sailfish. 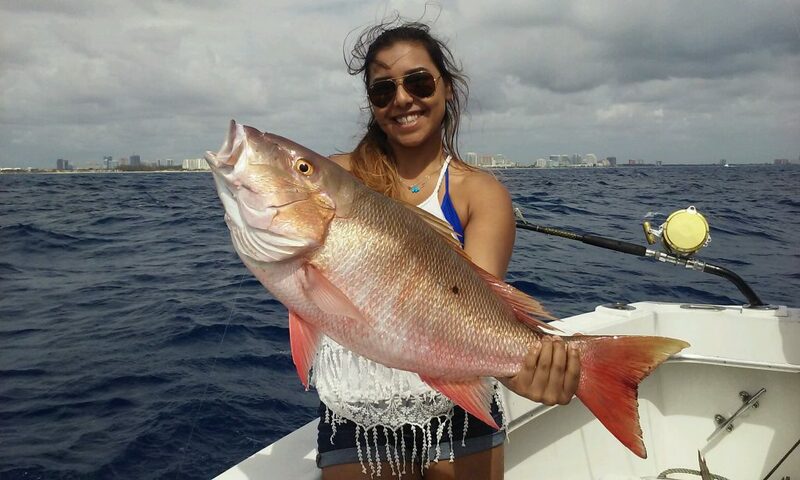 You can catch just about anything on the reefs this month. Yesterday, one of our charters actually caught a blue marlin in only 300ft of water. That’s incredibly rare for us to catch a blue marlin fishing in Fort Lauderdale, and to catch one in so shallow is quite a feat. Like I always say, you can catch anything and everything in Fort Lauderdale in the Spring months. Wreck fishing is the other golden ticket fishing technique this time of year. The wrecks are holding some big fish. Amberjacks are the big dogs of the wrecks and they are aggressive. They inhale just about anything you drop down to the bottom near the wrecks. Live baits work great fishing for jacks around the wrecks. This time of year with the jacks all stacked up around these shipwrecks, we sometimes can’t even get the bait to the bottom without getting a hit. Besides amberjacks, there are also almaco jacks, grouper, cobia and sharks that can be caught bottom fishing around the wrecks. It’s a great time of year and there are lots of fish biting, no matter where you go or what you fish for in Fort Lauderdale. There’s a lot of action on our fishing trips this month. 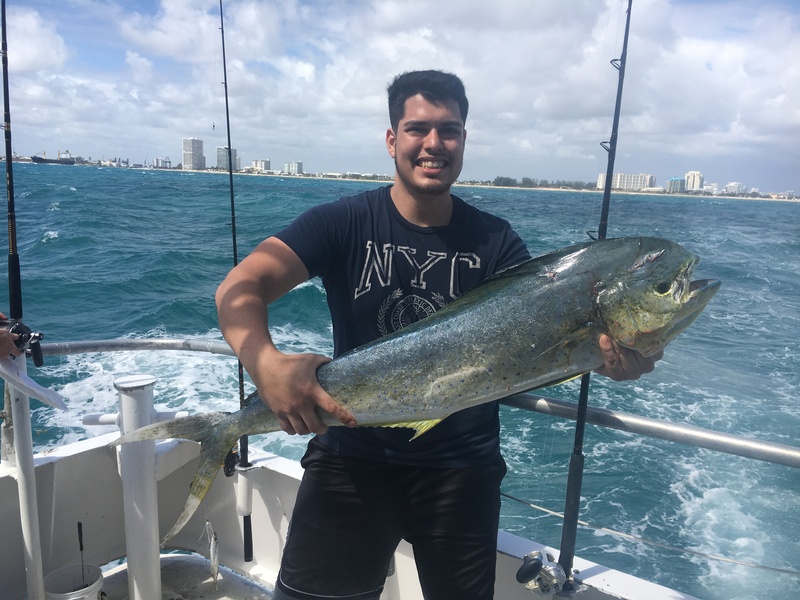 Some of the biggest fish of my lifetime have been caught fishing Ft Lauderdale in April and May. 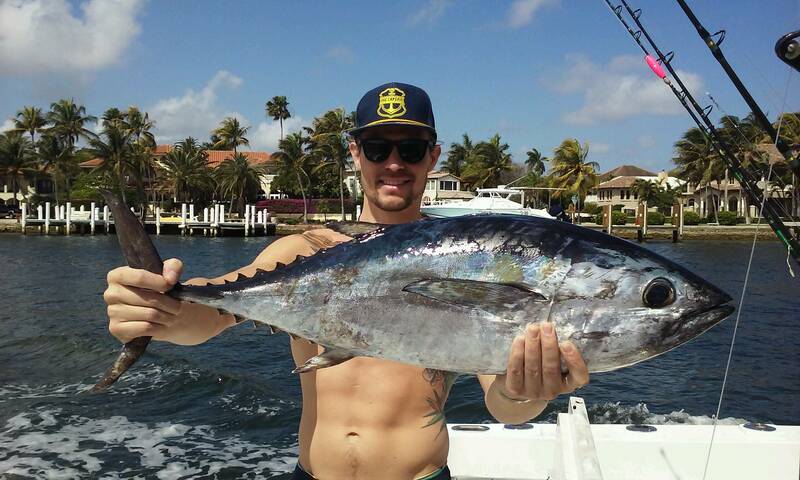 It’s my favorite time of year for fishing and Ft Lauderdale is the best fishing destination in the world this month. Let’s go fishing! Nice red grouper caught on our drift fishing trip aboard the Catch My Drift.